MIAMI, Florida — Royal Caribbean International is one of the world’s largest cruise lines, with 21 ships to its name that sail to the most popular destinations in the Caribbean, Europe, Alaska, South America, the Far East, and Australia and New Zealand. The compnay goes all-out to give its guests the ultimate vacation with world-class restaurants, designer shopping, and entertainment including Broadway hit musicals – lit by Martin lighting with audio provided by a host of HARMAN Professional audio components and loudspeakers. Royal Caribbean does things in a big way, with ships as large as 225,282 gross tonnage. Each vessel is equipped with several thousand Martin intelligent lighting fixtures, notes Paul Riley, Fleet Technical Operations, Sound, Lighting and Rigging. The ships use all types of Martin lighting including MAC Wash, Entour, Profile, Aura and many other LED, short-arc discharge and tungsten halogen lamp models. In addition, Martin’s LightJockey2 software-based control system is used in nearly all of the ships’ discos and smaller entertainment spaces. 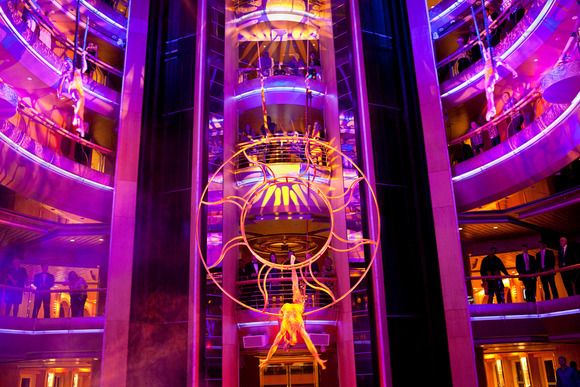 On each ship Royal Caribbean has at least two shows in the main theater, one generally a higher-energy show with a rock edge, and the other a more theatrical production. “Three ships have actual Broadway productions on them, ‘Hairspray,’ ‘Chicago’ and ‘Saturday Night Fever,’” noted Riley. Shows on several ships also feature ice skating rinks with international skating stars, aerial acrobats and AquaTheaters, high-dive and water shows that are held in large amphitheaters at the back of the ships. On the audio side, Riley points out that dozens upon dozens of JBL Control 23s series speakers and JBL Control 1s are installed in discos, lounges, sports bars, centrums and other areas. Royal Caribbean uses various Crown amplifiers almost exclusively in all the entertainment venues on its Vision Class ships and the Majesty of the Seas, and Riley points out that the Crown Macro Tech and Micro Tech amps that were installed in the fleet’s Majesty and Vision Class ships in the early 1990s are still in service today. A selection of dbx compressors and Lexicon effects units are employed everywhere from the largest theaters to smaller venues. “BSS Soundweb London signal processors and audio networking products are the only DSPs we use in the main theaters, secondary lounges, studios and larger entertainment venues on all 21 of our ships,” Riley said. “The newer, larger ships use BSS products almost exclusively in every venue and all those systems are networked to provide extensive centralized audio control capabilities throughout each vessel. Royal Caribbean has been using BSS extensively on ships built since the early 2000s and nearly all older boats have been retrofitted with BSS gear.